Having a canister vacuum cleaner in your house brings convenience in more than one way. You know how hard it is to clean all the messes after your kids and pets. Well, for this reason exactly, you should consider buying a canister vacuum. A good canister vacuum review helps you choose based on performance, mobility and quality. More so, these vacuums help you achieve freshness in your household quickly and efficiently. They clean all types of flooring, whether it’s a heavy carpet you have or hardwood floors. On the other hand, many of these lightweight products can even clean drapes for extra convenience. We’ve found the 11 absolute best canister vacuum cleaners on the market. If you want to find the right vacuum for you take time and check out our comparison table, as well as our review on each product. One of the most important factors to consider is the vacuum’s performance. Along with weight and other factors, performance can greatly affect your final decision. However, there are many on the market, so we made a table with best canister vacuums to consider if you’re looking to buy one. As you can see, there are quite a few things that are important about a canister model. One of the most important factors is the noise level. Naturally, you don’t want a cleaner that’s loud enough to upset the entire household. No doubt, when it comes to bagless canister vacuums, it’s important to know their canister capacity. Another few things to consider are cord length and weight of the device. Of course, it’s important to have a long cable, especially when cleaning large houses. At last, all of these factors decide its cleaning performance. Maybe you already decided which model would work the best for your house. If not, take a look at each product review below to find out more about them. We’re all familiar with the quality of Bissell products. When it comes to this upright vacuum, there are quite a few things you should know. First and foremost, it has a lot of suction power that delivers amazing results. It cleans all sorts of messes from your hardwood floor, carpet, upholstery, etc. It features a brush roll on and off switch for extra convenience. Thanks to this feature, you can easily go from one floor surface to another. Conveniently, all of its tools work as one-click tools. Actually, this means you can attach the upholstery tool, wand, and both dusting tools easily and quickly. Because it’s upright you can use it and store it just as easily. Also, it features a 23ft long electricity cable that allows you to go without having to unplug it all the time. Overall, this is an upright canister vacuum that’s best to maneuver with all over your house. Customers said how it takes time to get used to this brush roll. More precisely, if you’ve never used a cleaner with a brush roll before, you’ll have to adjust to it. Simply, it’s a different kind of a vacuum cleaner that works in a different way. Above all, there are no complaints on its vacuuming performance, but there are opinions that it’s a little too heavy. Features a long 23ft cable. Takes only one click to change the tools. In our opinion, it’s a good model to have in your house. Precisely, it features a long cable, it’s not very loud and it’s convenient to use. Of course, it’s considered heavy, but compared to others on the market, this one is actually a lightweight cleaner. Dyson is one of the best brands out there, so it’s only normal that we include their model in our review. This model is corded, and you get 25ft long power cord with it. Also, it features two Tier Radial cyclones that capture more debris than any other cleaner. Meanwhile, its ball technology allows it to move around easily. It comes with a carbon fiber brush, and anti-static brushes that remove all debris and dust from hard floors. It weighs only 13.8lbs, which is important to remember. Also, the vacuum is quiet at only 80dB. Its canister capacity is 0.8l, which isn’t a lot, but it’s enough for smaller houses and apartments. Finally, Dyson offers 5 years warranty on parts and labor. Many have complained how they have to empty the canister very often. However, this is simply because its canister doesn’t have big capacity to begin with. In any case, it has only 0.8l capacity, so make sure you keep that in mind when you’re looking for a cleaning ally for your house. Surely, if you have a small home, you won’t have a problem. If you have any pets in your house, you probably know the struggle of trying to clean up the hair they shred. Ultimately, the vacuuming performance of this model is best shown when cleaning up tiny pet hairs, dust and dirt. It has a long cable, which is convenient. However, its canister capacity isn’t as big, and therefore, it’s probably best for small apartments and houses. This is the best model for you if you’re looking for a quiet device that’s equally as effective. It features steerable technology which means it’s very friendly to work with and maneuver. The technology makes it easy to clean around furniture and reach all areas that aren’t as accessible. Next, this device features WindTunnel 3 Technology that delivers 3 channels of suction. This allows it to lift and discard dust and dirt. You get 5 speeds that allow you to match the suction power and motor speed to whatever surface you’re cleaning. In addition, it has a HEPA Media filter that traps 99.97% of dust, pollens, and dirt down to 0.3 microns. This means you can clean all kinds of messes quickly and easily. With this device, you get a crevice tool, hard floor brush, dusting brush and a telescoping extension wand. Overall, Hoover always did a great job with their products, but this one stands out the most when it comes to cleaning devices. Customers who have this model say that the attachments don’t come off easily. In reality, it’s a little hard to go from one attachment tool to another which is what bothers the most. Regrettably, there isn’t really a solution to this problem because it’s the way it is. Maybe, the whole process just takes a little time to get used to. If you want to clean as silently as possible, this is the right model for you. 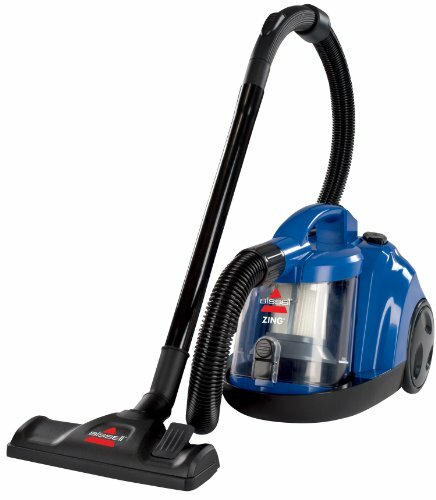 In the first place, it performs well in all floor surfaces and collects up to 99.97% of dust, pollen, pet hair, etc. Most of all, it’s good to have a cleaner that’s not as loud just because you’ll be able to clean at any time you like. Hence, it won’t disturb your family or next door neighbors. If you are looking a vacuum for hardwood floors, Panasonic MC-CL943 is the perfect solution for you. It’s powerful and has a set of features that are always useful. First, we must mention its 11Amp motor. The motor delivers enough power to clean your entire house without fearing that the device would overheat. In addition, it features Jet Force technology that delivers superior suction. The vacuum is lightweight and maneuverable. It’s quiet and bagless, too. Also, its dust cup is washable. You get an edge grabber attachment that allows you to clean near walls and corners. Pet hair doesn’t stand a chance because of the double roller pet brush. Still, what’s really great is that it’s suitable for all surfaces and all sorts of messes on them. The power nozzle cleans without scratching, which is great for stone, tile, laminates and hardwood floors. Lastly, it has a HEPA filter that’s the standard of quality. The biggest critic that customers had was on the plastic parts of this cleaner. Apparently, this happens due to a few plastic parts that aren’t as reliable. Reportedly, they break easily. Of course, if you use it accordingly and appropriately, we’re sure you won’t have any trouble of this sort. Finally, if something like this happens, make sure to contact Panasonic’s customer support. In our opinion, this is a great model if you have many different floors in your house. Most of all, if you have pets and there’s a lot of dust around your home, this would be a good choice for you. However, note that it’s mainly made of plastic so you have to use it accordingly if you want it to last. No doubt, there are even benefits to plastic parts like the decrease of weight of the cleaner. This Ovente cleaner is ideal for everyone who suffers from asthma or has any allergies. Simply, it features a HEPA filter that captures up to 99.97% of particles that are 0.3 micrometers in diameter. As you know, that size is about 300 times smaller than hair. On another hand, it’s efficient and delivers outstanding results thanks to its many features and specifications. First and foremost, it comes with many different attachments and tools that allow you to easily clean all kinds of messes. For example, you get a floor brush, upholstery tool, crevice nozzle, telescopic metal wand, multi-angle brush, and a pet hair brush. As you can see, this is suitable for many different surfaces and kinds of dirt. What’s really convenient is that the on/off button is actually a step button which makes everything easier. In addition, the cable is retractable and swivels in 360 degrees. The wand is bendable for extra convenience. It saves energy with its suction control and allows you to clean easily and smoothly. There’s a LED light that tells you when the filters are full. All you should do is wash them and you’re ready to use it again. What’s inconvenient and many don’t like is the power line length. The cable is 16ft long which isn’t much so if you have a lot of space to clean, you may not find it as convenient. You’ll have to keep unplugging the device and relocating it. In addition, certain customers noted how their power cord tends to get really warm. If it happens to you, we advise you to use your best judgment. If the power cord is overheated in your opinion, unplug the device and contact customer support for consulting. Overall, it’s one of the best models that’s bagless and features HEPA filters. First, its suction control is one of our favorite things about it. Second, let’s not forget its cleaning performance and how it can pick up even the smallest particles. Keep in mind, overheating is something that happens a lot, and all you have to do is just be a little careful. Here’s another great device from Hoover, but this time it’s bagless and corded. It features the same Wind Tunnel 3 Technology that you can find in most Hoover products. This technology allows it to lift and clean most stubborn dust and dirt. Even if the dirt is well embedded, there’s no doubt that this device will be able to remove it. Multi-cyclonic air goes through two stages to filter the dirt from the air path. This means you won’t experience any loss of suction, which is important. Its steerable technology provides smooth navigation around any corners, furniture, stairs, etc. The rewind cable is only 17ft long, which isn’t much so the best is if you live in a small apartment or house. Overall, it comes with a 3in1 tool, telescopic extension wand and a hard floor brush. Some said how it’s heavy and almost impossible to carry up the stairs. If you have pets, you’ll have to clean the brush rather often because pet hair can clog it easily. Of course, this is an issue for pet owners, because they shred all the time and you want to be able to pick up that hair. However, the device is suitable for embedded dirt, but not as suitable for pet hair. Unless you have pets, you’ll love this model. Simply, its remarkable results and ease of use are what makes it as popular. Its suction power is great for all dirt that’s very hard to clean and all other messes. All in all, you should definitely give it a try if you’re looking for something for your apartment. It’s great for everyone who don’t like noise and want their floors perfectly clean after each time. The device features Silence Pro System which is actually its canister, sound softening nozzle and motor all working as a team. They provide great results and minimal noise. It easily cleans all areas that are hard to reach, even around stairs, furniture, etc. You can do that with its crevice tool, upholstery nozzle and dusting brush. It features clean-air filtration system and a HEPA filter. This means it picks up 99.97% of dust and debris, which is great for someone who suffers from any allergies. Ultimately, the Silent Performer Multicyclonic’s dual nozzles go from hard floor to carpet easily and smoothly. Powerful suction is great, but apparently there can be way too much suction. More precisely, some said how it’s hard to push over rugs because it has so much suction power. Unfortunately, this isn’t something you can change, so it’s probably best to take it only if you don’t have as many rugs in your home. As we said, unless you have many carpets and rugs in your home, you’ll be pleased with how it performs. Surely, its powerful suction is definitely a plus because it picks up all dust and dirt without error. However, the same suction is too much for carpets and it pulls them making it very hard to go over them. All in all, it cleans all messes and it’s durable, just not suitable for carpets. If you want powerful suction suitable for all floors, this is the right tool for you. It cleans all dust, dirt and leaves your floors fresh and clean. It works well on bare floors, carpets, rugs and all above floor surfaces. In addition, it’s compact and best to maneuver with around furniture, stairs and all areas that are hard to reach. It’s important to note that it’s quite lightweight at 12.5lbs which adds to its convenience. The device switches from floor to carpet easily with nothing more than the flip of a switch. This is amazing because it allows you to clean smoothly without any major complications. It features things like a full bag indicator, suction control, rewind power cable, and a telescopic wand. These specifications make it as popular and provide quality of performance altogether. There’s a little design flaw that most customers are displeased with. As it seems, it’s lightweight, but its tube is made of metal. Reportedly, this makes the wand as heavy as the device itself, which is confusing. In fact, not only it adds a lot to the weight of the device, but it’s tiring and heavy to carry around. Finally, we recommend this model to everyone who doesn’t have a lot of surface to clean. Ideally, if you live in a small apartment and with no stairs, this is a great solution for you. 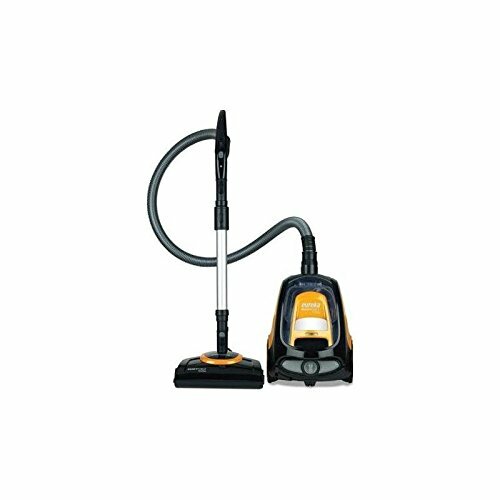 Its features and power of suction make a great cleaner that’s effective against all kinds of dust and dirt. What make it deserve to be on our list are its abilities to clean all kinds of mess from all kinds of surfaces. If you have low-pile carpets as well as hard and smooth floors, you’ll find it more than efficient. Precisely, it has AIITeQ Combination floorhead at allows you to go from one surface to another by just clicking the rocker switch. Its telescopic wind is stainless which means it’s durable and will last you a long time. In addition, it features a rewind power cable that pulls back automatically. These features provide a cleaning radius of 29-5ft. Furthermore, the device comes with a dusting brush, crevice tool and an upholstery tool. They’re all held in one place by a VarioClip. When it comes to filtration, Miele’s C1 Compact cleaner features the Miele AirClean filtration system. It’s efficient and captures around 99.9% of dust and allergens. The only critic is the fact they have to bend over to reach any control buttons on the device. In truth, this isn’t very convenient and it sets people back. Sure, it works well and it’s durable, but you’ll have to bend over if you want to turn it on or off, or for any other control button. Simply, it’d be more convenient if the controls were within you’re the reach of your hand. Overall, the important thing is that it has great abilities of cleaning even the tiniest dust. However, it’s a little inconvenient because it’s not upright, and its buttons are not within the reach of your hand. In any case, if you can neglect that and find other things more important than, you’ll like this device. Finally, we suggest it to everyone who needs cleaning both hard floors and carpets and wants a durable house ally. This Eureka model is lightweight and the best to carry around. It weights as little as 9lbs which means you can carry it up and down the stairs with no problem at all. Its 12-amp motor is what gives you the superior suction suitable even for deep cleaning. What’s really great about the cleaner is that you can clean out outdoor spaces with it. More precisely, it features Blower Port that blows away the dust and dirt. There are a few cleaning tools that are worth mentioning such as a crevice tool, dual purpose dusting brush and an upholstery nozzle. These all help you clean even those areas that are hard to reach. The dust bag removes easily to avoid messy emptying. Another convenient thing about it is that it has a cable storage that prevents it from tangling. In addition, the extension wand provides long reach to help you clean out areas that are hard to reach. Reportedly, this model isn’t suitable for picking up any hair, pet or human. For this reason, we suggest you only opt for it if you don’t have any pets in your home. In addition, customers have said how the device is very loud. Unfortunately, we couldn’t find out just how loud it is, but based on customer reviews it’s not the quietest cleaner out there. Overall, you should be pleased with it if you don’t have any pets and don’t mind a little noise while cleaning. In reality, it’s powerful and convenient, and does a great job in vacuuming all kinds of floors. Finally, we like it because it’s convenient for storing away when not in use, and it’s lightweight and easy to work with. If a commercial cleaner is what you want, then this is the right choice for you. It’s powerful in every sense of the word. First and foremost, it’s important we say that its built-in blower gives more versatility when you’re cleaning. Second, it has a reusable commercial cloth bag that has a paper option. More so, its compact form allows you to easily store it away when you’re not using it. Of course, the form has another benefit which is the ability to clean tight spaces and areas that are hard to reach. The hose stretches so you can have a better reach to those hard-to-reach areas. Its power cable is 33ft long which is very convenient and means you can clean without having to switch sockets all the time. Naturally, this means you can clean halls, gyms and other large areas. Strangely, even though it’s a commercial vacuum cleaner that works well in large areas, it doesn’t work as well on carpets. As a matter of fact, most of the customers said how they’re happy with its work on hard floors and outdoors, but disappointed in how it works on carpets. Keep this in mind if you have a few carpets in your home. We recommend this particular cleaner to everyone who has large areas to vacuum. Precisely, if you own a gym, or a wedding hall, this device will be very useful to you. Even if you just want to use it at home, it’s a good choice because you can reach tight areas and store it away easily. However, make sure you don’t have any carpets in your home. First, there are different models that perform in a different way. As a consequence, there are models that work well in all surfaces, while there are models that only work on carpets or only on hard floors. Of course, this is a matter of preference and depends of the kind of flooring you have in your home. 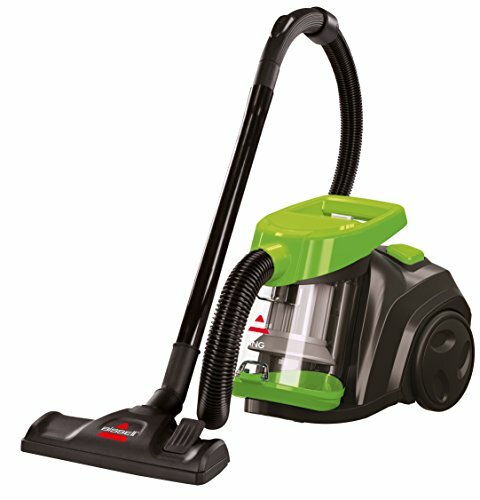 The difference is in suction power that is directly connected to how well the cleaner performs. When we say convenience, we mean the ease of use and storage. Surely, you want a device that’s compact to use and store away when not in use. Most importantly, look for a model that’s upright and has a system that keeps the cord folded. We suggest you pay attention to the type of floor the cleaner works best on. Simply, it’s better to have one device that can clean all surfaces if you have both carpets and hard floors in your home. In any case, upright models usually have all control buttons close to your hands. This is one of the most important factors to consider when buying a vacuum. The last thing you want is an extremely heavy cleaner that’s impossible to maneuver with. Therefore, look for a lightweight model that’s a no problem to carry around. Pay attention if the vacuum cleaner is upright or not and will it be a problem to move it around your furniture. Also, if you have stairs, the best is to choose a vacuum that’s lightweight and has a compact design. Design is important and delivers more than just esthetics. More precisely, look for a compact design that would be best to use in tight spaces. You want your vacuum cleaner to be able to fit in small areas that aren’t as close to reach. The best is to get an upright model that’s very good to work with. The design decides convenience as well, which is why it’s important to consider it. There’s nothing better than a clean house and fresh floors. For this reason, you should take time in finding the best cleaner for you. Luckily, there are many models, so it’s certain that you’ll find one. Canister vacuums are convenient and easiest to use, which is why many choose them over any other kind of vacuums. Think about your personal preference and what you need in a vacuum cleaner. We always recommend vacuums that are upright, compact and easy to maneuver with. Simply, portability and performance are the two most important things that you should pay attention to. In addition, handheld vacuums as well as an upright type have many benefits that can make a big change in how you clean your carpets and floors.